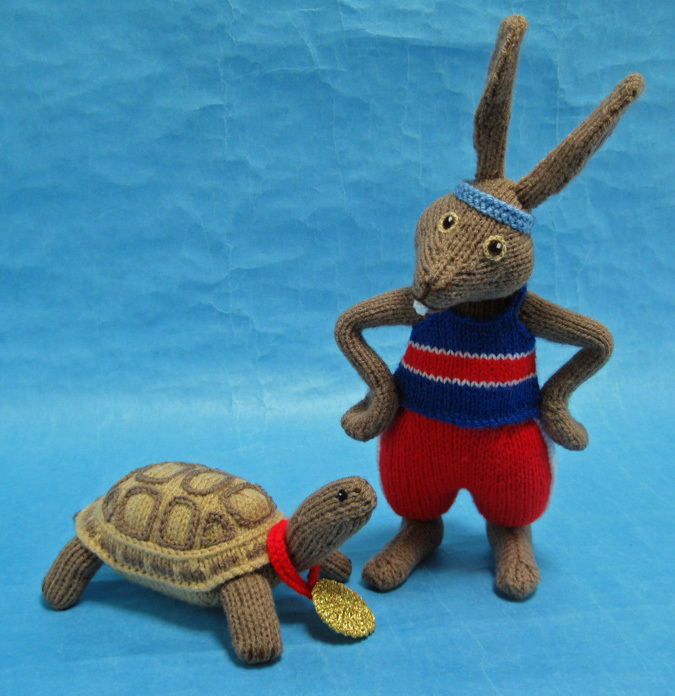 On your marks, get set, KNIT! Measurements: The tortoise is 3½in (9cm) tall and 7in (18cm) long, and the hare is 11½in (29cm) tall. You will need Of Hayfield Bonus DK 100g balls: 44g in Walnut 927, 12g each in Signal Red 977 and Wheat 816, and 6g in Royal 979; 2g oddment of white DK yarn; 1g oddment of light blue DK yarn; 1yd (1m) length of chocolate brown DK yarn; 18in (50cm) length of black DK yarn; of Twilley’s Goldfingering 25g balls: 1 in Gold 002; pair of 3mm (no.11) knitting needles; stitch holder; 60g washable toy stuffing; long tweezers.